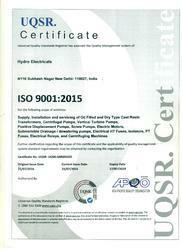 Incorporated in the year 1989, Hydro Electricals has carved a remarkable niche in the market. Ownership type of our corporation is a sole proprietorship. The headquarter of our corporation is situated in New Delhi, Delhi (India). We are the prominent manufacturer and exporter, involved in offering a superb quality assortment of Transformer Protection Fuses, Expulsion Fuses, Switch Fuses, Electrical Starter and many more. The entire product range is precisely manufactured by using premium quality raw material and latest technologies. The exposure of our professionals in the field is clubbed with the in-depth knowledge and understanding of the requirements of the global market. We also specialize in customization of a product according to the specific needs of various industries across the globe. Backed by an diligent team of sales and marketing, our workforce understands the requirements of and customers and make dedicated efforts to deliver products according to their needs. Our team works in conformance with the international standards and abides by the guidelines so as to maintain quality parameters. Because of their dedication and hard work, we have been able to establish ourself both in the national and international markets. We are now amongst the top notch distributors of rotary displacement pumps. We hold regular training sessions for our personnel so as to keep up with the changing demands of our customers. Backed by an experience of more than two decades, we have been supplying a wide range of rotary positive displacement pumps to our customers in India as well as abroad. Authorized dealer of superior quality pumps.